After leaving Ely, I had a long trip to the Lake District. To avoid a 15 hour train journey (most of which would have been waiting around in train stations), I gave myself a layover in Leeds. 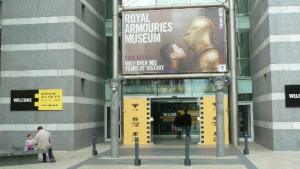 An afternoon and evening in Leeds gave me the opportunity to vist the Royal Armouries Museum. The museum houses a collection of military armoury from througout the history of England, up to the present day. It is well exhibited, with inventive interactions throughout the collection. My only criticism of the museum would be a fairly confusing layout. The weird routes between galleries and floors, meant that I had to double back through galleries, and I’m not quite sure I saw everything.